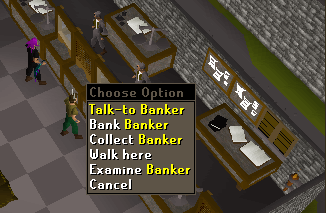 These pages contain the basic information needed to keep your RuneScape account secure. If you are currently in the process of being hijacked, please click here if your registered email hasn't been changed and here if it has. The first steps to take when setting up the security on your account is making sure that you have a secure computer. Ideally, at the very least, you'll want to run up to date antivirus, antispyware and a firewall. Once you have your chosen software installed, make sure that you run a full system scan, to ensure that there is no malicious software already on your computer. Next you'll want to create a brand new email account to register on your RuneScape account. The security of this email account is very important so we recommend that you don't use it on any other websites, especially websites that are associated with RuneScape (such as fan or clan sites). Once you've created your email account, you'll need to set up 2-step verification. This will help to prevent people from accessing your email account, even if they manage to learn your password. Phishing emails will typically be sent on mass to hundreds of people, many of which don't even have a RuneScape account. 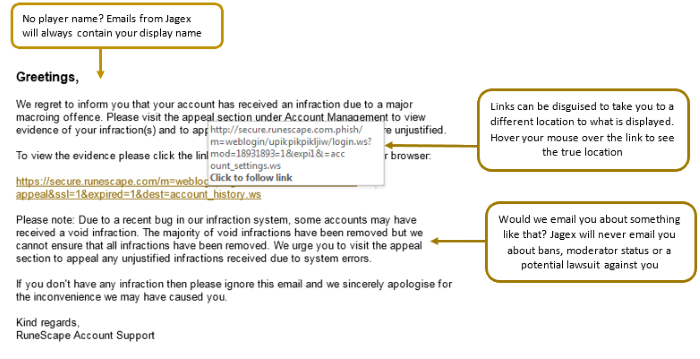 These emails are designed to look as though they have been distributed by us and contain links to malicious websites that are designed to steal your login information or infect your computer with malicious software. The pages that these accounts are telling you to search for will typically contain links to phishing sites or keyloggers. Please make sure that you NEVER click these links.